My birthday, so you know I’m an expert. Search on title What about the title? stemming “try” and “trying”, “tries”, and “tried” will be recorded in the index under the single concept word "tri." def self.table_name "users_with_recent_activity" end def readonly? Will it work with full text search? How resistant to change is it? Let's find out - time for some feature creep! $ cat app/views/searches_v02.sql SELECT id AS article_id, title || ' ' || body AS the_text FROM articles UNION SELECT articles.id AS article_id, authors.name AS the_text FROM authors JOIN articles ON authors.id = articles.author_id UNION SELECT article_id, body AS the_text FROM comments Because most times you’ll have a small change to make and that’s easier. What about pre-built solutions? There are a lot of good options out there. cru f t in models. 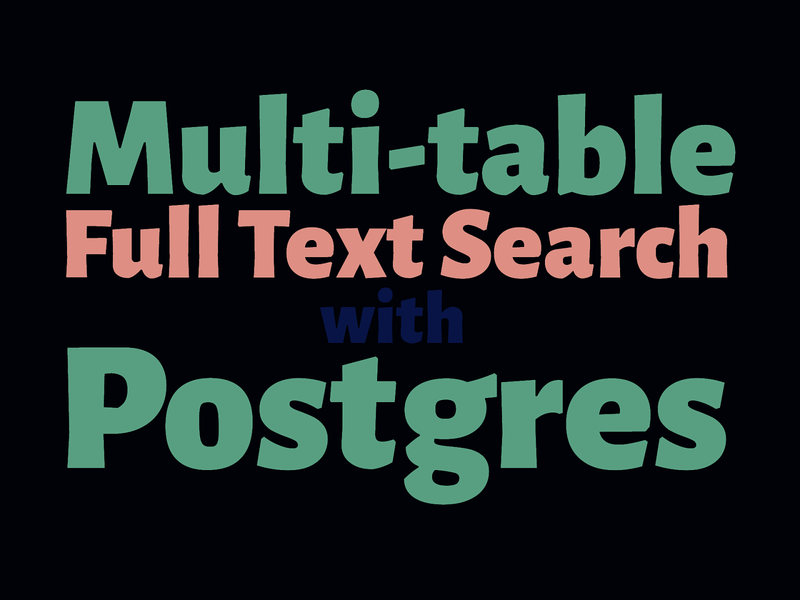 View Multi-table Full Text Search in Postgres on Notist. Easily searching across an application’s data is a pervasive need. If you are lucky, you can get away with simple sorting or searching on a single column, but it is more likely that you need full text search across multiple models, all from a single search <input>. Thanks to the power of Postgres’ full text search, rolling your own search isn't too difficult. Following an actual feature evolution which I worked on for a client, we will start with a search feature that queries a single column with LIKE and build up to finding results across multiple columns on multiple tables using database views, optimizing the query time with full text indices and representing the results as a polymorphic association on an ActiveRecord model in Rails.